The Year in Review posts march on! And if the LA Times recently picked their best architecture moments of 2009, let's take a look at some of the more ignoble and depressing moments of the year. Ennis House Needs a Hero: With the economy taking its toll not just on private owners but also on public institutions, the Ennis House hits the market. The proposed sale of the Frank Lloyd Wright-designed estate illustrates the difficulties faced by institutions in restoring and maintaining historic homes. The house is still listed for $15 million. Buck Rogers High Becomes a Boondoggle: In 2009, the Coop Himmelb(l)au-designed Central Los Angeles High School #9 opened amidst criticism and controversy. The design has been criticized, and the school has faced challenges to both its bloated budget and curriculum. Passing of legends:Yes, Julius Shulman was 98. But he was the subject of a documentary, available for commissions, and active in LA's architecture community. LA also lost preservationist Martin Weil this year as well as architectural photographer Marvin Rand. Museums in Turmoil: The financial troubles of LA's museums are well-documented. But this year has been particularly brutal at MOCA, which let its architecture curator, Brooke Hodge, go in June, and canceled a planned Morphosis exhibit. LACMA endured an ridiculous incident that saw director Martin Scorsese chastise the museum over its threats to cancel its weekend film program (since spared a death sentence), while we're still waiting for director Michael Govan to fulfill that promise to acquire significant residential architecture. And if Govan had no choice in the design of ho-hum looking BCAM, a project picked by Eli Broad and Govan's predecessor (and many would argue that LACMA would be better off if it weren't on Broad's leash) will LACMA fare better with a possible collaboration with Swiss architect Peter Zumthor? Let's hope. Development's Backward Dive: The NFL Stadium: Environmental rules? Transit oriented development? Mixed use? First the proposed NFL stadium in Industry leapfrogged over CEQA with a sign-off that allowed an exemption from an environmental review. 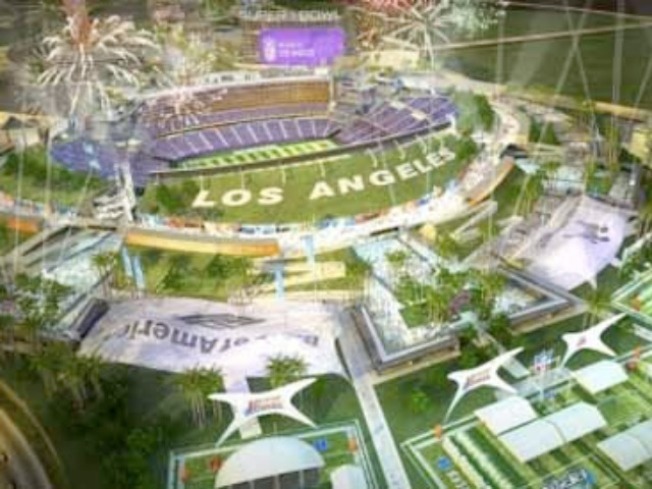 The location discourages both transportation (situated more than a mile from a Metrolink stop) and development (the area bounded by freeways and warehouses), and as LA Times critic Christopher Hawthorne's notes, the project underscores how the stadium represents a giant leap backwards for planning. Furlough Fallout: With furloughs already in place, the city's fiscal crisis means that up to 40 employees in the planning department may be taking an early retirement. The projected result? It looks like plans to update outdated zoning rules will also be shelved. Venice Misses An Opportunity: Oh Venice. You do realize you're part of the greater city, don't you? This year the neighborhood gave the smackdown to an Eric Owen Moss-designed mixed-use project on the corner of Venice and Lincoln. The look of the project was debatable, but now the developer is saying that without the support of project, he'll build a simple three-story commercial center. Is that what traffic-clogged Lincoln Boulevard really needs? How about making this stretch of Lincoln more hospitable? Case in point: Look what Kanner Architects did with that new residential project across the corner.